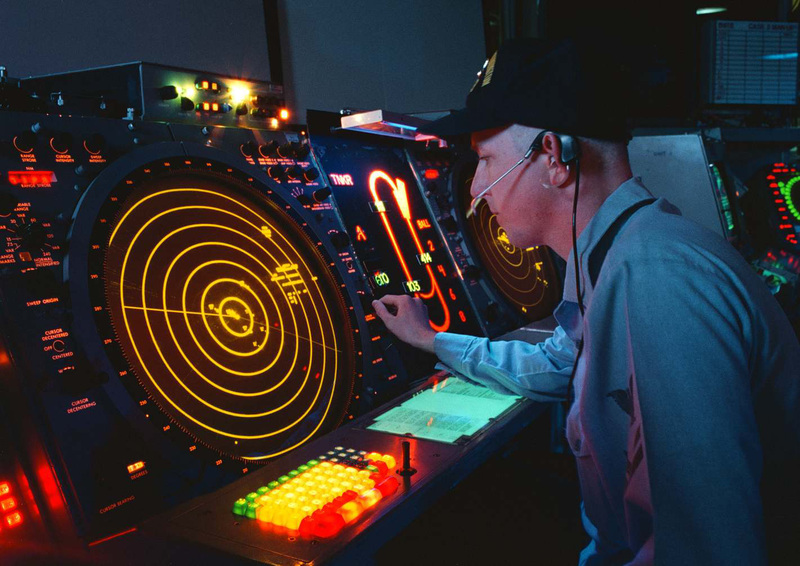 A U.S. Navy air traffic controller watches his radar scope where he works as an Aircraft Approach Controller in the Carrier Air Traffic Control Center on board the USS George Washington (CVN 73) on Jan. 30, 1996. The controller is responsible for ensuring the safe, orderly and expeditious flow of air traffic operating in the vicinity of the aircraft carrier. The nuclear powered aircraft carrier and its battle group are en route to the Mediterranean Sea for a scheduled six-month deployment. While there, they will patrol the waters of the Adriatic Sea in support of the NATO Implementation Force (IFOR) in Operation Joint Endeavor. DoD photo by Airman Joe Hendricks, U.S. Navy.